In the earliest known post-Tapinocephalus Zone fauna of southern Africa (where the fossil record for late Permian tetrapods is most complete), new groups of big herbivores - the beaked and toothless dicynodonts - appear. These were clearly descended from those genera which were common but restricted to small body sizes during the Tapinocephalus Zone. Initial diversity of large dicynodonts may have been low, with one genus, Endothiodon, dominating some early local faunas. But within a relatively short period more big dicynodont families were added, and at the acme of Endothiodon-Dicynodont Empire (faunal stages 4 and 5 in Fig. 2) four fully terrestrial big families are common, plus pareiasaurs, the big aquatic herbivores that were the only survivors over 15 kg from the Dinocephalian empire. Biomass D rises during this period, and appears to reach maximum in the Capitanian age, some time before end of the Endothiodon-Dicynodont Empire. In the latest fauna (late Daptocephalus zone, Wuchiapingian age, stage 5 in Fig. 2) one genus, Daptocephalus, increases in relative frequency at the expense of the other big herbivores; thus local diversity, measured by D, decreases although all of the genera and families seem to be present right through to the end of the zone. Only one family dominates the top predator role, the gorgonopsians, making up nearly all the specimens known (C in Fig. 2). Large gorgonopsids were present but very rare in the preceding Tapinocephalus Zone (Dinocephalian empire). The medium-size hipposaurids, also present in the Tapinocephalus Zone, were wide-spread but uncommon. Reconstructed food web for the terrestrial and aquatic components of the Severodvinian Community (Malokinelskaya and Vyasovskaya svitas; Late Tatarian) of the SE of European Russia. Lines with arrows indicate the movement of energy through the community: solid lines show feeding pathways, and dashed lines show decay pathways. Aquatic components: (1) aquatic plants, (2) invertebrates, taxa whose role in terrestrial food chains is insignificant. Amphibious components: taxa which play a significant role in both aquatic and terrestrial food chains. Terrestrial components: (3) plants, (4) invertebrates, taxa which play a role in terrestrial food chains; (5) plant and animal detritus; (6) palaeonisciform, (7) larva of amphibians, (8) Dvinosaurus, (9) Karpinskiosaurus, (10) Chroniosaurus, (11) kotlassiid Microphon, (12) pareiasaur Proelginia, (13) Suminia, (14) dicynodonts, (15) gorgonopsians. By the late Tatarian, the ecosystem had further matured. Vertebrate faunas from the Malokinelskaya and Vyazovskaya svitas, the Severodvinian Community (Fig. 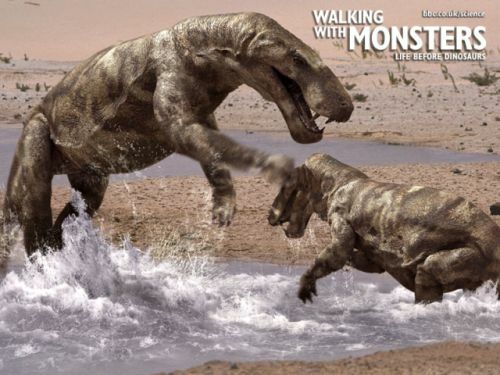 21), show the usual palaeonisciform, and other, fishes and tetrapod larvae feeding on aquatic plants and insects, and they in turn being preyed on by the batrachomorph Dvinosaurus and the reptiliomorphs Microphon, Karpinskiosaurus and Chroniosaurus. Terrestrial herbivores include the basal anomodont Suminia, medium-sized dicynodonts, and the giant pareiasaur Proelginia. The top predators were gorgonopsians, which could presumably have killed a large, thick-skinned pareiasaur with their sabre teeth.